Russia held elections in the occupied territories of Crimea and Sevastopol. Verkhovna Rada recognized on Tuesday the September 18 elections to the State Duma of Russia illegitimate. The bill, supported by 264 Ukrainian lawmakers, reads that the holding of elections in the temporarily occupied territory of the Autonomous Republic of Crimea and Sevastopol posed a violation of the Constitution and laws of Ukraine, the basic principles and norms of international law, the UN Charter, the Helsinki Final Act, the Budapest Memorandum 1994, the UN General Assembly resolution on the territorial integrity of Ukraine, adopted on March 27, 2014, and other international legal acts. In the explanatory note, the bill says that in the State Duma consists of 450 deputies, of which 225 are elected in single-member districts (including four seats in Crimea and Sevastopol), and another 225 Russian lawmakers are elected on party lists in the federal constituency. 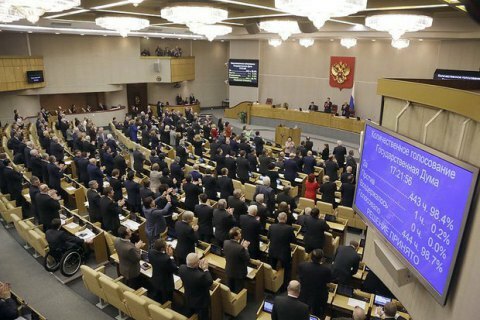 Thus, 229 deputies were elected in the occupied territory of Crimea and Sevastopol, ie the majority of the constitutional composition of the State Duma. In this connection, Ukrainian parliament cannot recognize the legitimacy of the elections and their results, including the structure, powers, acts, decisions of the seventh convocation of the State Duma. Rada voted to address the Security Council and the General Assembly of the UN, the parliaments of foreign states, international parliamentary assemblies and organizations to also do not recognize the legitimacy of the State Duma elections.